Practically abutting Santa Margherita Liguria is Rapallo, a slightly bigger and better-known seaside resort. Like Santa, Rapallo has two excellent focaccia-makers (the half dozen others are fine, but nothing special). Despite the cold weather, we had remarkable ice cream at Frigidarium, one of our favorite places on the Riviera, then ambled over to Panificio Fratelli Castruccio on Piazza Giuseppe Garibaldi. Both are near Rapallo’s tiny though fearsome castle, which has the Mediterranean as a moat. Castruccio’s focaccia is classic—crisp outside, tender inside, pleasantly oily, and with the right amount of salt. Perhaps even better, despite the lousy location, is the focaccia made by the Bolelli family at Panetteria-Pasticceria Tigullio. It’s on busy Via della Libertà, which is an ugly, straight street parallel to the river (it’s the main road to the autostrada). I wasn’t carrying my caliper, but I did use my thumbnail measuring device to confirm that both these bakeries still bake focaccia with approximately quarter-dollar-sized pocks. 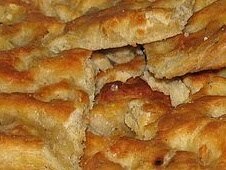 More on classic Ligurian focaccia from Genoa, soon. And then there’s the famed focaccia with cheese—con formaggio. We revisited a favorite Riviera restaurant that still makes it so fabulously well that we wonder if it’s even better than the best from Recco.